2010 August — Dayna Macy, author of "Ravenous"
My ten year old sons, Jack and Matthew, went for a walk today. 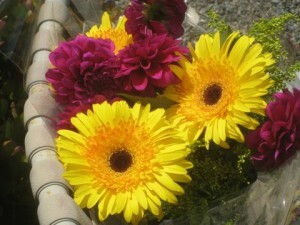 An hour later, they came home, and gave me these flowers. I have the kindest, nicest sons. I am so touched by them, and so proud of them. If I’m wilting in this heat, the bees are getting slaughtered. 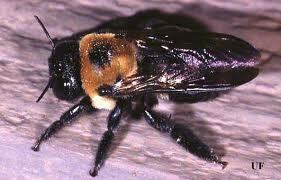 There are a dozen dead carpenter bees on my deck. If it’s 90 degrees outside, it must be 120 inside the wood beam on our deck where they live. Liz Gilbert’s book, Eat, Pray, Love is a worldwide phenomenon — nine million copies and counting. Liz is a really, really good writer, and I’m happy for her. But it’s her companion perfumes that have inspired me to think bigger. 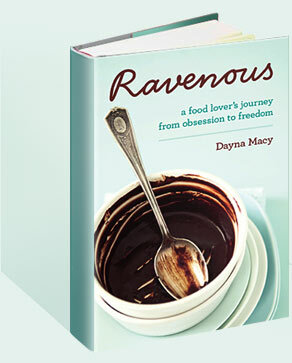 I’m thrilled to say that I’ve just been approached by a fragrance company to create a companion scent to my memoir, Ravenous, which will be published in February 2011. We had our first meeting and we’ve boiled down the scent to base notes of salami and camenbert, mid notes of black olives and cheetos, with a top note (light) of cheesecake (plain). The company believes, and I agree, that when readers of my memoir spritz themselves with Ravenous, the perfume, they will be transported into the world of bingeing and overeating like they never dreamed possible. We call this “augmented reality,” and it’s what every author should aspire to. We’re hoping they can create an edible bottle in time for launch so that if the spritzer/reader has a deep urge to binge big, she can eat the bottle too. Neither of us could come up with any response.